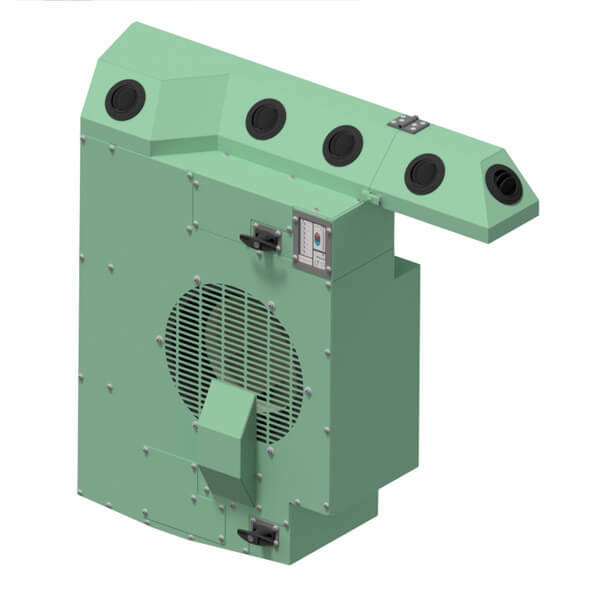 Modular air conditioning system (ACU) to supply 8kW cooling to ensure a cabin temperature of 23 – 26°C max in a 45°C ambient, provided the loco is thermally insulated. The aircon is a split system with a UNICO inverter and scroll compressor. 11kW of heating is available and controlled by the UNICO inverter to the desired set-point on the Human Machine Interface (HMI). The aircon unit is equipped with a custom designed electronic power inverter, capable of all control and safety functions. The controller activates subsystems as required to regulate the cabin temperature to the desired setting on the control panel (HMI). The system has a USB interface for remote monitoring via laptop for maintenance and fault finding.